Labor Day gatherings are the Last Hurrah of the Summer for many of us. Especially here in Michigan where most of the students don't return to school until after the Labor Day Holiday. To celebrate, I asked the members of our Festive Foodies group to join me in posting some recipes that our readers could use to make their holiday special. Our friends, Rob and Linda (pictured above) were kind enough to allow us to bring The Angel Face, Marissa and one of Marissa's friends over to spend the day at their lake house. They have a gorgeous home with beach front on Lake Huron. We love going there. We spend time looking for Petoskey stones or other interesting rocks. We swim, we sun, we eat, we drink, we talk, we laugh and we leave happy and exhausted. The least I could do, to thank them for their hospitality, is provide lunch. I decided to make a giant Muffuletta. This is the perfect picnic food because the longer it is wrapped up and refrigerated the better the flavors meld. You start by making the olive salad the day before you are going to assemble the sandwich. 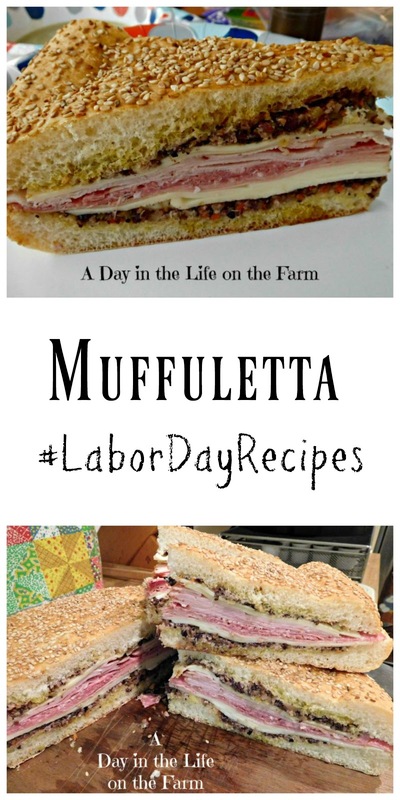 Then you head to the bakery and pick up a Muffuletta loaf. Of course, you can always make your own loaf if you have time on your hands and the gumption to do so. I didn't have either. You can use any round seeded loaf that you desire. In the morning, just cut the bread in half and slather generously with the olive salad. 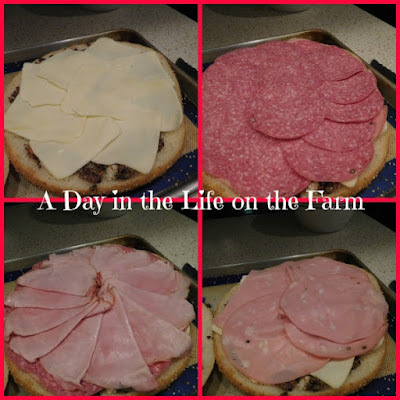 Then you start layering all of those delicious cheeses and cold cuts until they are gone. Put on the top half of the loaf and wrap it up tightly. Refrigerate until ready to serve. Each sandwich will give you 6-8 very generous, entree size portions. You can make the portions smaller if you are serving up side salads or other mains. When making for a potluck, you can cut the sandwich into squares instead of wedges and serve up to 16. And now for my recipe. I guess the real recipe here is for the olive salad. Everything else is just assembly. For an easy peasy dish this is very impressive, not to mention delicious. Place the olives, garlic, capers, celery, carrots and pepperoncini in the bowl of a food processor and pulse until coarsely chopped. Remove to a bowl and season with the celery seed, oregano, basil and pepper. Stir in the vinegar and oil until well combined. Cover and refrigerate overnight. Slice the bread in half, horizontally. Spread both halves of the bread with the olive salad, allowing the oil to soak into the bread. Layer the bottom half of the loaf with the Mozzarella. Add a layer each of salami, ham, and Mortadella. Finish with a layer of Provolone and cover with the top half of the loaf. Seal in plastic wrap and refrigerate for several hours before serving. Can I say how much I love seeing this recipe...as I'm visiting Louisiana??? It's been my favorite thing here so far...just so perfect and yummy! We ate a small piece of one on our food tour the other day and you better believe I'll be ordering one someplace else before I leave here. Also, I may have sent three jars of the most popular and delicious olive spread home...you know, just so I can be lazy over the next few weeks and have awesome sandwiches for dinner!!! I've never been to LA but it is on my bucket list. That is one incredible sandwich! !